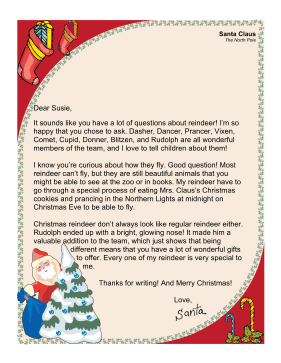 This letter from Santa gives a whimsical answer to the question of how reindeer fly. It sounds like you have a lot of questions about reindeer! I'm so happy that you chose to ask. Dasher, Dancer, Prancer, Vixen, Comet, Cupid, Donner, Blitzen, and Rudolph are all wonderful members of the team, and I love to tell children about them! I know you're curious about how they fly. Good question! Most reindeer can't fly, but they are still beautiful animals that you might be able to see at the zoo or in books. My reindeer have to go through a special process of eating Mrs. Claus's Christmas cookies and prancing in the Northern Lights at midnight on Christmas Eve to be able to fly. Christmas reindeer don't always look like regular reindeer either. Rudolph ended up with a bright, glowing nose! It made him a valuable addition to the team, which just shows that being different means that you have a lot of wonderful gifts to offer. Every one of my reindeer is very special to me. Thanks for writing! And Merry Christmas!